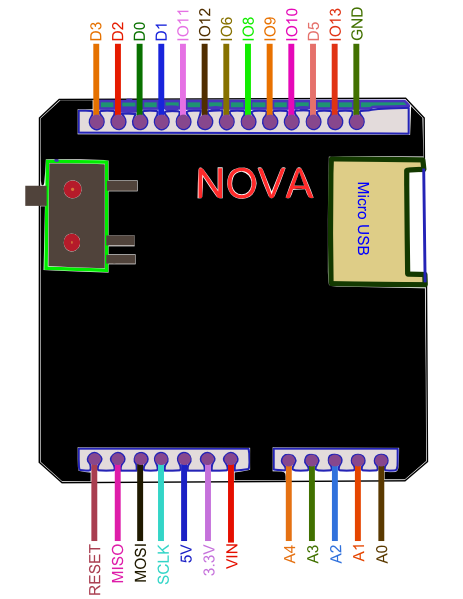 Nova uses MEGA32U4 as its main processing unit, so it resembles Arduino Leonardo but more portable. 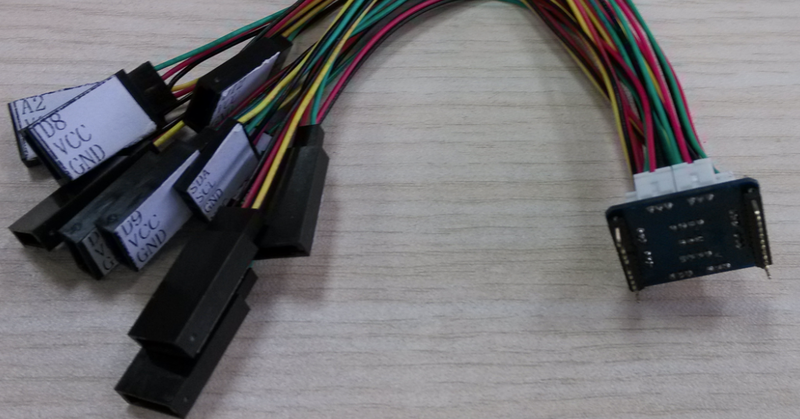 And because of its small size, it can be easily used in toys, installation art, virtual reality and game peripherals. 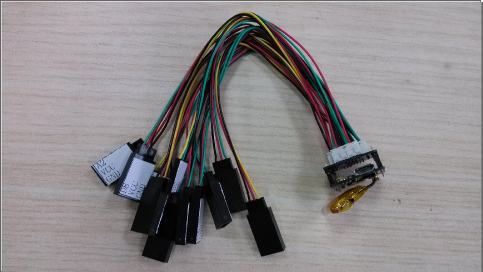 It's so convenient to us that it uses 3.7V lithium battery which was supplied free for source supply，and you can use Micro USB for battery charging. The ports can be clearly distinguished as the picture performanced. And once you have gotten a Nova, you can easily know which port is D13 and which one is A0, etc. Now let's forget most of the limitation caused by the big sharp of any other controllers, this new product can provide a small size which only measures 22mm*20mm. This module can be seaily put in some small place and then work for you. And beacuse this module contains a battery, so you can let it alone and don't need to supply power through a long wire. What's more, we had put a acceleration sensor on the board, so you can do more things with this product like vibration measurement, posture transportation and so on. And it can be more interesting when you try to controll your LEDs use the value measured by your acceleration sensor, the LEDs can show the moving of your board, it is cool. The small size means less limitation, why not put it in your pocket or on your door, it can color your home and light your cloth. You can get the pin out in the right image, and the way to use this module is as the same as Leonardo but be care that not all the pins were given for you because of the limitation of its small size. Before you use this product, you can look up the website http://arduino.cc/en/Main/ArduinoBoardLeonardo for details of the function of the pin you need. The code below shows how to make LEDs change their light between dark to bright circularly. And it can be more beautiful if your LEDs have different kinds of color. 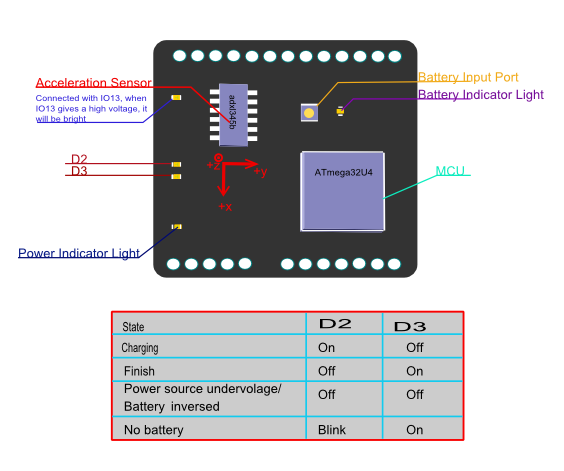 analogWrite(9,i);                    //LEDs will be brighter with a rising "i"
analogWrite(9,i);                   //LEDs will be darker with a declining "i"
As there is an acceleration sensor on the board，we can do something more interesting. You need not change your connection because we will use it again. 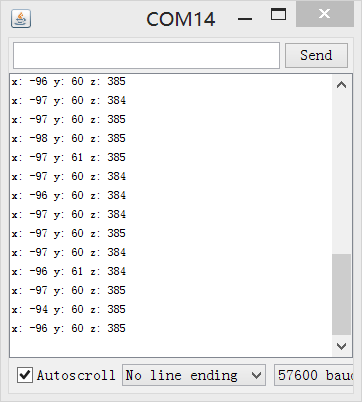 The code below can make LEDs show the posture of your board through adxl345b, which is the acceleration sensor mentioned previously.And you can check that whether you get the value of acceleration from serial. Serial.begin(57600);  // start serial for output. Make sure you set your Serial Monitor to the same! A1 A couple reports indicate issues with the bootloader and a solution is to upload the latest leonardo bootloader to Nova. The procedure is simple, requiring only a ISP programmer. plug in the ISP wires and flash the leonardo bootloader onto the nova board again, unbricking the Nova. A1 On a side note, beware the battery connector, must be kept away from the pins on board, failing to do so could break the pins or even the controller if shorted. Electric tape on top of the pins could potentially help avoid this problem. A1 For any questions, advice or cool ideas to share, please visit the DFRobot Forum. Get Nova Basic Kit (a Coin-sized Arduino Compatible Controller) from DFRobot Store or DFRobot Distributor.